Shortly after posting our signs for both our future vineyard and winery and farm and ranch we discovered that the name of “Silver Star” was associated with many low quality products in the State of Texas, hence our name change to “Stewart-Rigo” which represents the proud maiden name of my wife and my last name. 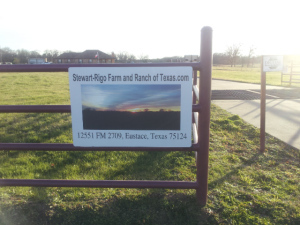 The beautiful picture on the new farm and ranch sign actually comes from a picture taken of our farm and ranch. We are proud to announce that our new name of our farm and ranch is now posted. After research and finding the name of “Silver Star” itself was associated with many low quality products in Texas, we decided to change our names on both our future winery as well as our farm and ranch. The name consists of the proud maiden name of my wife and my last name. The view on the sign comes from our own ranch.